Brutally cold air will enter Michiana beginning on Tuesday, Jan. 30. The National Weather Service has issued a Wind Chill Warning for the entire listening area which starts Tuesday night and ends Thursday afternoon. patchy blowing and drifting snow and reduced visibilities. * WHERE...Portions of northern Indiana. Patchy blowing and drifting snow possible. Temperatures will drop from the mid-teens on with possible record cold highs for Wednesday. It is important to are dressing warmly and limit time outdoors as temperatures and wind chill will be dangerously cold. Temperatures start to make it back into the teens Friday. Lake effect snow continues through Thursday. effect snow bands. Winds gusting as high as 35 mph with areas of blowing and drifting snow. Wind chills as low as 45 below zero expected. Tuesday: A chance of snow showers before 10am, then a chance of snow showers after 1pm. Patchy blowing snow after 10am. Mostly cloudy and cold, with a temperature falling to around 1 by 5pm. Wind chill values as low as -20. West wind 15 to 20 mph, with gusts as high as 30 mph. Chance of precipitation is 40%. Tuesday Night: A 30 percent chance of snow showers, mainly after 1am. Patchy blowing snow before midnight, then patchy blowing snow after 1am. Mostly cloudy, with a low around -18. 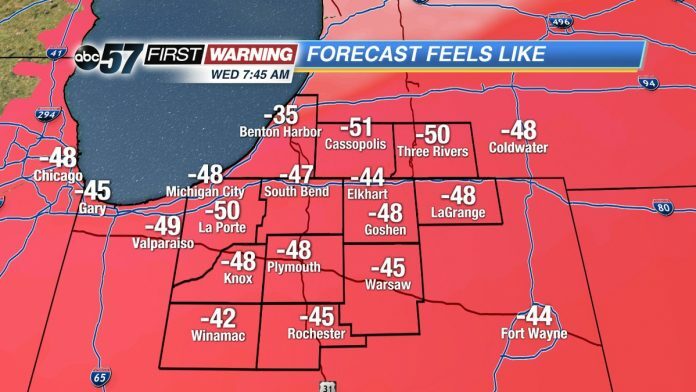 Wind chill values as low as -40. West wind 15 to 20 mph, with gusts as high as 30 mph. Wednesday: A 30 percent chance of snow showers before 1pm. Patchy blowing snow. Partly sunny and cold, with a high near -13. West wind 15 to 20 mph, with gusts as high as 30 mph. Wednesday Night: Mostly cloudy, with a low around -18. Thursday: Mostly sunny and cold, with a high near -2. Thursday Night: Snow likely after 1am. Mostly cloudy, with a low around -7. Chance of precipitation is 70%. Friday: A 50 percent chance of snow before 1pm. Cloudy and cold, with a high near 18. Friday Night: Mostly cloudy, with a low around 11. Praying that electricity remains on for all of us who lives in the area. Everyone please be safe and ready to help your neighbors if needed.